Refer to applications to understand the different uses and properties of each product. High transparency, suitable for high mesh count, recommended for everyday use. Clear base is designed to be used as an everyday product for printing as an underbase, or to be used as mixing transparent. Having a stable viscosity and smooth layer, gives an exceptional result when applied on garment. Commonly know as opaque base or transparent white. MIXOPAQUE BASE is specifically designed for inter color mixing, while making a opaque shade of color or as a covering base for dark color garments. It is recommended to use MIXOPAQUE BASE on lower count screen mesh. Specifically designed for people who love to play with colors. T-MIXING BASE is desgined to make colors with toners, allowing printers to make the shade of their choice, with the depth of their requirement without losing the innitial properties of the color. T-MIXING BASE can absorb a high amount toner dosage without losing the viscosity or properties. Glossy appearance, easy to mix and highly transparent. Glitter base is designed to mix and blends glitters of your choice. Allowing you to get the best results with cost efficiency by maintaining stock. Compatible with any glitter, easy to mix and ready to run on press. 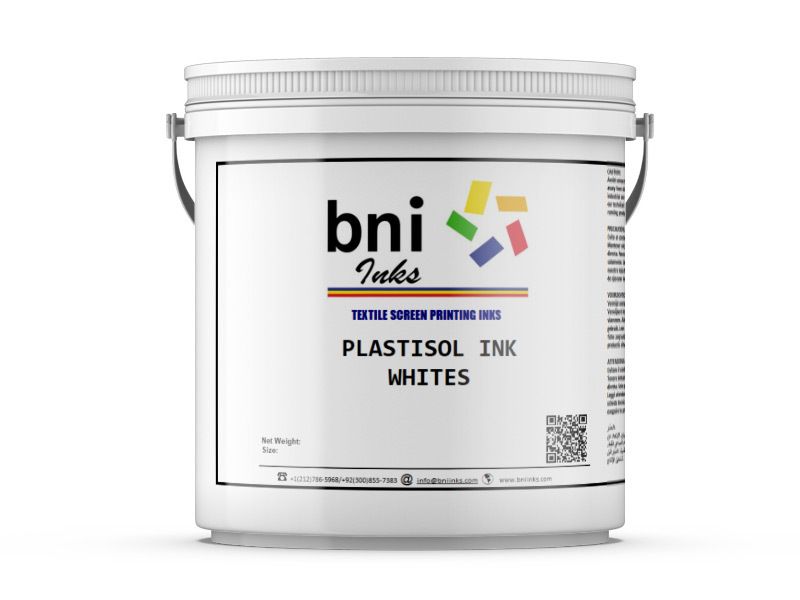 Every day use plastisol white for cotton fabrics. GP White is Cost effective, decent opacity and feasible on all print methods. Best to be used as a mixing white or on price tight jobs. Looking for a quality product with high opacity, cost efficiency for printing as opaque under base or white print alone. High Opaque white is your answer. Provides quick flash properties, helps in enhanced productivity and energy efficiency. Best to be used as an underbase white, when printing multi color job. 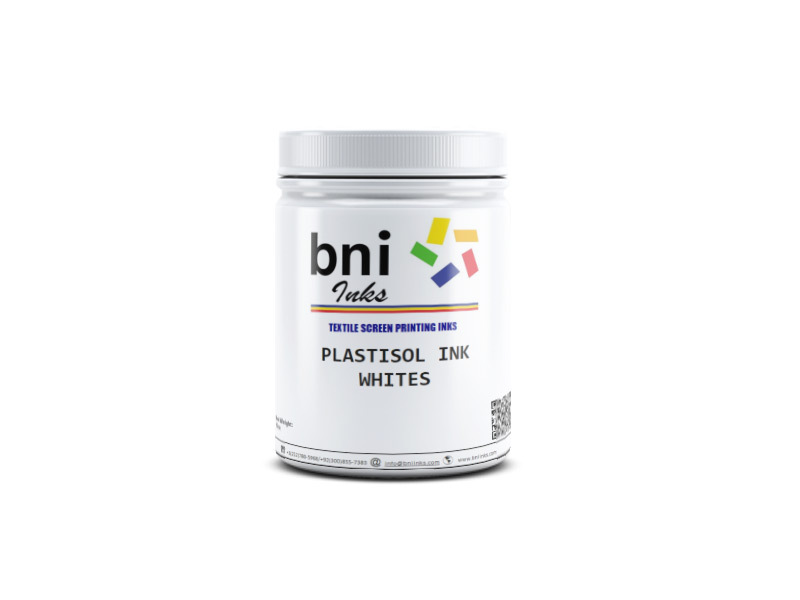 Best Seller by BNI Inks. An all in one white paste having high opacity, soft feel, creamy smooth viscosity, optical brilliant glowing appearance, low migrating properties and low temperature curing. If you are looking for quality and a product to cater all your needs, SPB is your choice to be. A recommended product for color bleeding 50/50 fabrics. A signature product specifically designed by BNI Inks to print on polyester, high color bleeding fabrics. High viscous, glowing appearance, soft feel and anti-migration are some of the properties of Athletic. Sometimes also known as the White Blocker, this product has made its mark in the international market.